Solid multiband dynamics combined with a creative edge makes MBC an extremely desirable plug-in for dance-heads. Good overall sound. Excellent single-band master limiter. Comprehensive controls and metering. Sensibly laid-out interface. DPC is a fantastic creative tool too. Not quite as warm as some. Vengeance-Sound made their name with their acclaimed sound libraries, but now they also make plug-ins. So far we've seen Multiband Sidechain for dual-band sidechain pumping effects and Metrum, a kick drum synthesiser. Their latest effort, Multiband Compressor, is the first in their Mastering Suite range, and it is much less esoteric than its predecessors - at least, at first glance. But why go multiband? "This plug-in looks awesome in action, and the meters give genuinely useful visual feedback." Multiband compressors and limiters are designed to apply frequency-specific dynamics processing, making them suitable for applying to complete tracks, since they typically have complex activity taking place across the entire frequency range. Multiband dynamics can be used as a corrective measure, to make a quiet, weak bottom end louder and more consistent, for example. Alternatively, they can be used to enhance a great mix by applying targeted compression or limiting, enabling you to pull specific frequencies of the track together without the level and balance being affected by other bands. 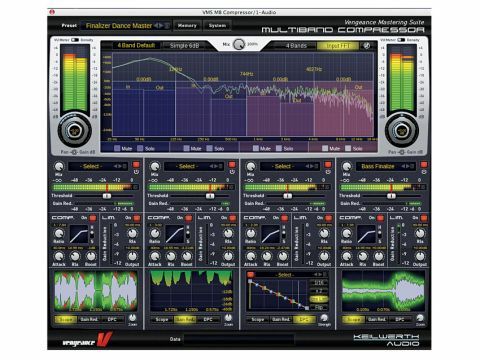 Multiband Compressor (MBC) offers up to four bands of precise dynamic control. On the surface, it's a pretty standard affair, with compression or limiting for each band and a master limiter on the output. The overall band ranges are set in the display window, as is the gain. It's all very straightforward. Some plug-ins offer more than four bands, but we think four is ample for most people's purposes. Take a closer look and you'll uncover a huge range of options. You can set the slope of the filters that divide the bands, from a very loose 6dB (resulting in lots of crossover from one to another) to a ruthlessly surgical 96dB. This setting will depend on the style of music you're mastering and the adjustments you're making. Then there are the dazzling meters and displays. It's fair to say that this plug-in looks awesome in action. The meters give genuinely useful visual feedback on the levels of signals going into and out of sections as well as the amount of attenuation going on. It's as comprehensive a visualisation system as we've ever seen and it makes MBC fun and exciting to use. Our only gripe is that the compression gain reduction meters are quite short but go right down to -48dB, so when applying 'sensible' amounts of compression (eg, a few dB), the meters are barely tickled. There's a huge range of presets, ranging from fun and creative to the (slightly useless) overall mastering templates; usefully, there are individual band presets too, for both compressor/limiter and DPC. Dynamic Pattern Compression is essentially a tempo sync'd multipoint amplitude envelope for each and every band. The results can range from something as simple as a subtly highlighted kick to utterly outrageous frequency-dependent pumping and bouncing. Each envelope curve consists of four segments, each with its own start/end height and fully adjustable curve shape. Timing-wise, you can set it so that each step represents a 16th-note, eighth-note or quarter-note. There's a knob for setting the strength of the amplitude modulation, a button to flip the curve upside down, and you can have the DPC take place either before or after the per-band limiter. The cool thing is that all of these settings are on a per-band basis, so you can mix up different timings, for example. Vengeance-Sound reckon that DPC is just the ticket for breathing dynamic life back into overly compressed or limited tracks, and when the settings are dialled in judiciously, this can be achieved. The real fun begins, though, when you start applying it to drum loops, synth lines, and so on, to superimpose wild rhythmic pumping. We strongly advise that you take a listen to the audio examples on the below. It's hard to give a simple verdict on MBC. On one hand, it is a very good-sounding multiband compressor and limiter, but to our ears, it's not quite as rich or as phattening as the likes of Waves L3 or Sonalksis MultiLimit. We found that this made it less suitable for 'natural' sonic material such as recordings of real instruments. If all you want is the very best in multiband dynamics and you work with lots of recordings, there are better (and probably pricier) options. For dance music, though, MBC can be incredibly effective. We tried it on full mixes ranging from tech house to chillout tracks and found that it can really push the loudness while pulling together the bottom, mid-range and treble. And you can push the levels very hard without causing distortion or any unpleasant sonic artifacts - certainly more so than with, say, the aforementioned Sonalksis processor. MBC's master output limiter is initially unimpressive, with audible pumping; however, disengage its auto release mode and set it to a fast time and it's right up there with the likes of Ozone 4's limiter, which is to say that it's excellent. With MBC, you also have to factor in the sheer creativity that DPC affords, which is a rare thing in the rather dour world of mastering effects. The level of control shouldn't be underestimated either, and there a number of features we haven't got space to go into, such as hard and soft knee operation, plus global and per-band wet/dry mix knobs, for parallel compression. When taking everything into consideration, MBC is an incredibly versatile and desirable plug-in, and for this type of processor, the price is quite reasonable too. In simple terms, then, MBC has two target audiences: those who want a well-priced and well-equipped multiband compressor/limiter to apply some final polish to complete electronic tracks, and those requiring an amazingly exciting and creative multiband dynamics processor. And if you want both? Then MBC goes beyond being merely a good deal to become a total no-brainer.